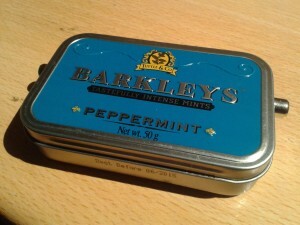 A while ago Tjeerd PA3GNZ donated me some Barkleys mint tins (identical to the famous Altoids tins), which are rather popular by QRP builders to house small homebrew stuff. 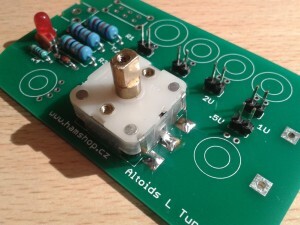 Two weeks later I found a czech webshop, offering a kit called “Altoids L-tuner”. This kit perfectly fits in such a tin. Since this tuner would be a perfect add-on for my 30m QRP transceiver, I immediately ordered it. The kit is a reproduction of a design made by Steve Weber KD1JV. 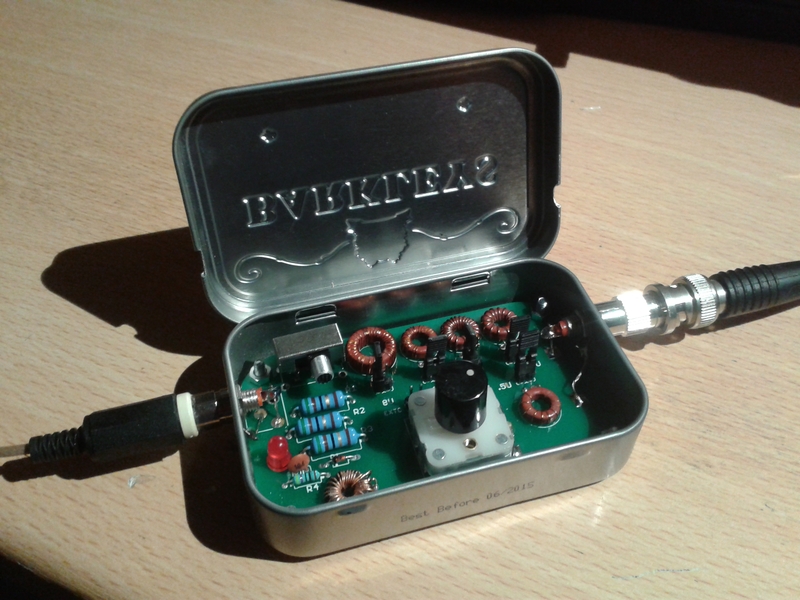 Steve named it the “Altoids Long Wire Tuner”. It is meant to tune long wire antennas for 10-40m. The design is a L-match (series inductor, parallel capacitor), it consists of 5 series connected inductors, followed by a variable capacitor to ground. By means of jumpers you can bypass individual inductors and thus select the desired inductance. 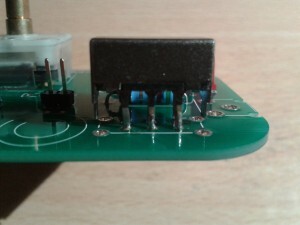 The circuit also includes a poor man’s SWR bridge, which can be enabled by a switch. The SWR is indicated by a LED. Original circuit diagram of the Altoids Long Wire Tuner, by Steve KD1JV. After about a month the package got finally delivered, probably delayed by the fact that I ordered the kit just a week before the yearly hamradio fest in Friedrichshafen. 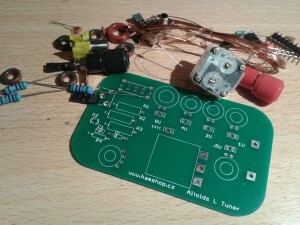 The kit consists of a high grade circuit board and all required components. No documentation was included, so I returned to the website and downloaded the documentation. This documentation is very poor, just one page showing the circuit and PCB layout. At the bottom of the page some URL’s are given, including a website that links to this PDF-document. This document is a comprehensive building instruction for this kit, telling you how to wind the different inductors and where to place all components. Altoids L tuner, lid closed. The switch didn’t fit, the PCB holes were to small, so I soldered the switch on top of it. The variable capacitor leads were too short, so I used small pieces of wire to connect it. I used superglue to fixate the capacitor and all inductors. I drilled a hole in each corner of the board and used bolts an nuts to place it into the tin. Between the board and the bottom of the tin I placed a plastic sheet to ensure isolation. I skipped the included onboard cinch connector and screw terminals, grabbed two screwtype cinch connectors instead from my junkbox, drilled holes in the case and placed the connectors. With some small wires I connected them to the board. The tuner seemed to be ready now, however I could not close the lid. This was caused by the capacitor, the axis was too long. I cut away most of it. I browsed my almost endlessly filled junkbox again and found a small knob which fits at the remaining part of the capacitor’s axis. Basic components placed on the board. The switch didn’t fit due to too small PCB holes. 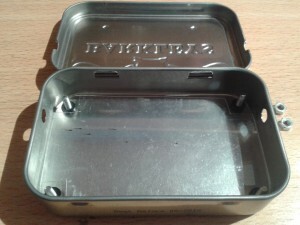 The prepared tin with bolts already in place. Note the small rings to maintain distance between board and bottom, and the isolating plastic sheet. 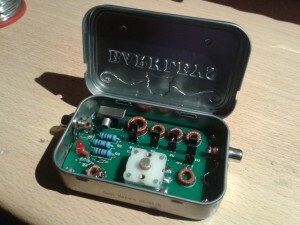 The board and connectors are placed in the tin.